I got to stroke another one off of my bucket list a few days ago. I've always wanted to see Stonehenge. Don't ask me why because I have no idea. But from the first time I saw a picture of this place I've felt a connection to it. The connection I'm talking about isn't the "I was once a druid priest who performed secret rituals here." It's more just the desire to be there. Sheree, relentlessly pragmatic, just shrugs when I start talking with her about Stonehenge. My English friend, David Hildich, refers to Stonehenge as a "pile of rocks." And they are both right, of course. Because whether or not Stonehenge exists means nothing to my life and it is, fundamentally a pile of rocks. But I still felt a happy little lurch in my spirit when I knew we were getting near. There can be no debate: Stonehenge is no accident. It's an "On Purpose" that occupied the attentions and desires of a civilization long dead. Why is it here? What was it for? I've read about it in umpteen books. Fiction has painted it as the site of arcane rituals, or gateways to time travel.Merlin whispered magical incantations here. It's been made a launching pad for aliens and crushed by a dwarf in Spinal Tap. But what IS it? What's it for? When I got out of the bus, camera poised, I could hardly wait to get close to it. I wasn't sure what it was going to feel like...only the quiet assurance that it was going to feel like SOMETHING. I didn't want a fabricated something -- a notion that rose out of my own expectations. I just wanted the authentic stuff. I would have died before admitting to Sheree that I felt nothing at all looking at Stonehenge. But that, aside from a profound disappointment, was what I was feeling. Again: I am not sure what I expected: ethereal visions of Druids stepping through the mists of time, lovely virgins weeping as they are led to the Stone of Sacrifice...Frank and/or Joe Hardy peeking around a corner at some lowlife crook doing something lowlife and crook-like. But I felt nothing at all. It was just a pile of rocks. I thought back to an experience at the war memorial in Washington. I couldn't connect with that one either. My friend, Alan Shapiro, told me to lighten up and listen to the music those war dead listened to -- and it worked. 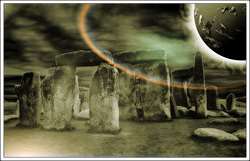 But what is the music of Stonehenge? I kept taking pictures. Nada. I walked around the pile...nada. Still. Then I thought: MAYBE the music of Stonehenge is silence. I planted myself down on a bench and sat quietly and tried to see the site with something other than my eyes. Can't put it more clearly than that. But there was a light cool breeze on my face and I became acutely aware that this place had been critically important to a bunch of Someones who lived and died centuries before I was even born. I thought about people building this place...coming here to...what? Is Stonehenge a calendar? Is it the site of sacrifices? Did the Druids come here? How about the Celts? What did the original architect look like? And then, on the heels of that: Does it matter? Stonehenge is what it is: a locale bristling with mystery and whispers I can't quite hear. But they're there. Maybe they are in the five burial mounds close to the site...maybe they echo through the stone itself. But they are there. I'm sure of it. I still don't know what it is...simply that IT is something lovely, mysterious and eloquently silent. It is a place that existed centuries before I was born and will still be here long after I am gone. I kinda like that. And I know that I can never see Stonehenge with my eyes. At least not my physical ones. To me...it looks like this.